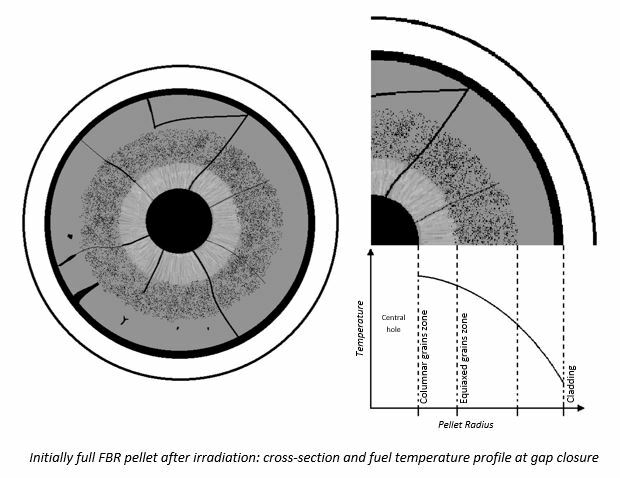 The severe environment and the interaction with the neutron flux during the in-pile irradiation lead to a relevant variation of the nuclear fuel structure and characteristics. In order to properly estimate the status of the thermo-mechanical properties and dimensional variations of the fuel pins, several fuel performance codes have been developed and validated in the last decades. The processing of this information allows the user to initialize the data for irradiated fuel pins for further analysis in transient conditions with the SIMMER code. Expert Group on Innovative Fuel, Benchmark in Fuel Performance codes and experiments. K. Lassmann, TRANSURANUS: a fuel rod analysis code ready for use, J. Nucl. Mater. 188 (1992) 295–302. M. Suzuki, H. Saitou, Y. Udagawa, F. Nagase, Light Water Reactor Fuel Analysis Code FEMAXI-7 ; Model and Structure, JAEA-Data/Code. (2013). T. Okawa, I. Tatewaki, T. Ishizu, H. Endo, Y. Tsuboi, H. Saitou, Fuel behavior analysis code FEMAXI-FBR development and validation for core disruptive accident, Prog. Nucl. Energy. 82 (2015) 80–85.